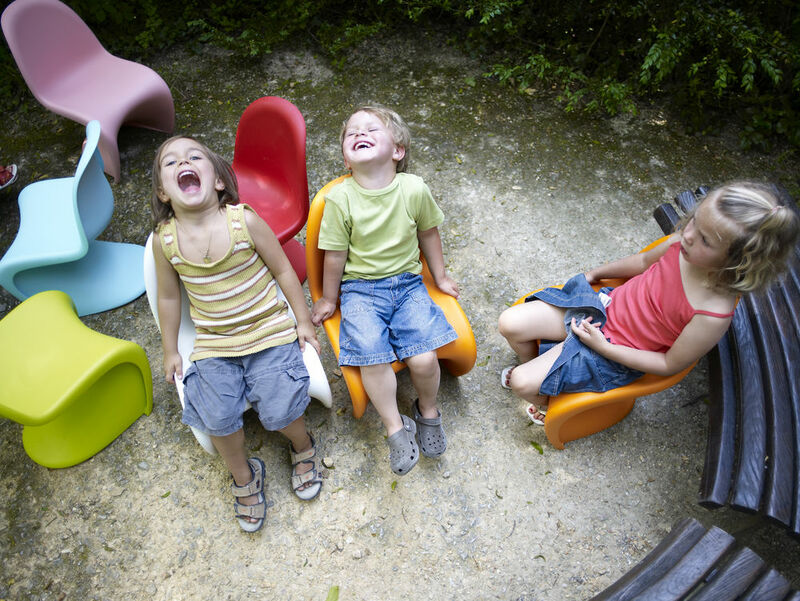 As a children's chair the Vitra Panton Junior, with its bright colours and playful form, causes young hearts to beat a little faster. Originally designed by Verner Panton in the late 1950s the Vitra plastic cantilever chair has become both a true classic and a genuine piece of design history. The sweeping form is aesthetically striking and cuts a uniquely good figure both in the classic large version as in the smaller junior version. Care To clean the plastic surfaces the use a soft, damp cloth and a mild, neutral detergent are recommended. 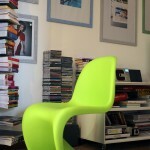 In terms of silhouette and shape the Vitra Panton Chair is a unique classic, which has become famous worldwide. Designed in 1959 by Verner Panton, the chair was the first cantilever chair formed in a single piece. The possibility for this formal revolution arose through the development of the first plastics, a material characterized by its high flexibility in terms of shape and colour: the silhouette of the Panton Chair would in all probability not have been possible with any other material. Despite this it still took nearly 10 years of development work by Verner Panton and Vitra until the plastic chair could be mass-produced. The single piece construction principle so fascinated Verner Panton that he worked his draft until he succeeded in creating a structure which was stable even without a base plate - a design decision which allows the Panton Chair to offer so much uninhibited legroom. 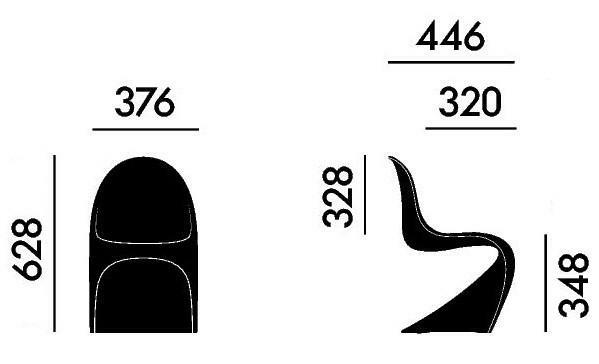 Many, including the then Herman Miller design director George Nelson, were of the opinion that the chair resembled a sculpture more than a piece of furniture and considered it too unconventional; however the commercial success proved Verner Panton correct. It was always Panton's intention to manufacture a kid's version of the chair, a wish that long went fulfilled due to economic obstacles. 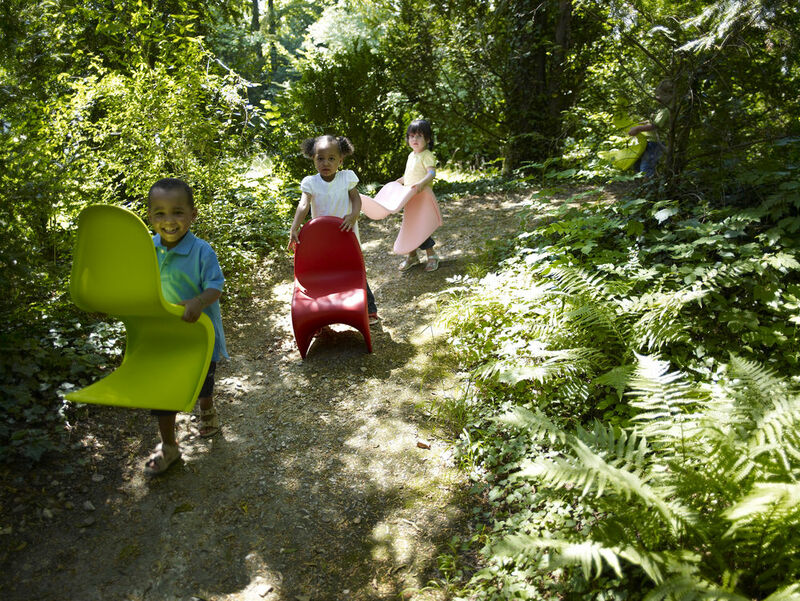 However since 2008, the Panton Junior has been manufactured by Vitra based on the original designs of Verner Panton. In relation to its big brother, the Panton Junior is about a quarter smaller, but it has exactly the same proportions as the original. 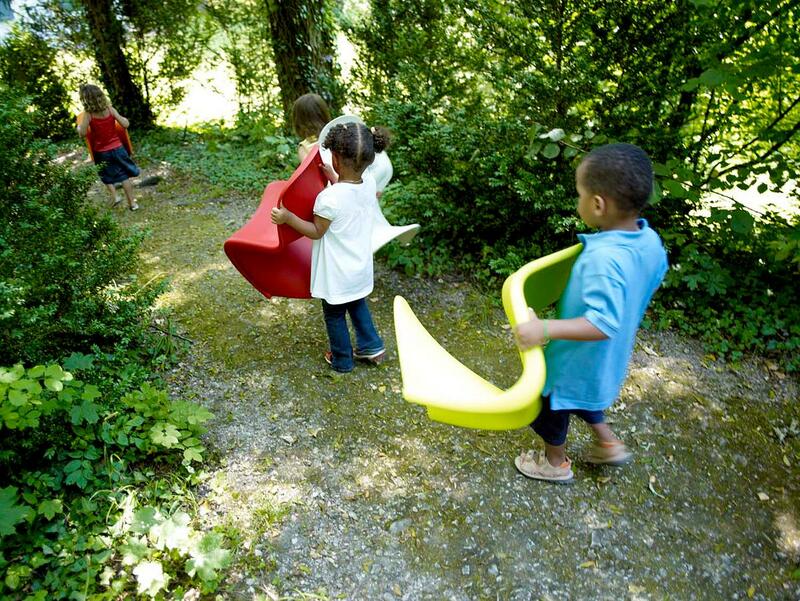 The playful S-shape of the chair is particularly well received by the young, and can be used as both a toy or seating - and in the nursery, in the garden, on the terrace or granny's living room. Born in 1926 in Gamtofte, Denmark, Verner Panton attended the Technical School in Odense, before being convinced by his parents to study architecture at the Royal Art Academy Copenhagen. However even then he harboured a passion for bright colours and unusual shapes and his first designs include drafts of legless chairs and indicate early considerations of the future Panton Chair. In Copenhagen Verner Panton became acquainted with Arne Jacobsen, including working for two years as an assistant in his office, and was involved in the development of, amongst other projects, the ever popular Ant Chair. The close association of the two designers' can be seen not only in their architectural education, but also their tendency to employ innovative technologies and unconventional forms. 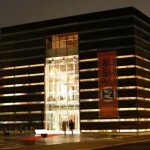 Panton greatly admired the work of Arne Jacobsen, as well as that of Poul Henningsen, his second important mentor. Despite the importance, and stature, of his two mentors Verner Panton developed his own style, which was particularly defined by his predilection for plastic, and also his passion for textiles, a genre in which he pursued his vision of blending spatial structures through the combination of furniture, ceilings and floors into a flowing unit. 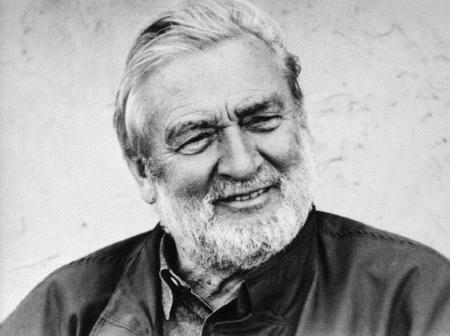 Since the 1960s Verner Panton's life was closely linked to the Swiss furniture manufacturer Vitra, for whom he also designed the Panton Chair. In later years, interest in his person waned somewhat, not least because of his concentration on plastics; a material which during the oil crisis became expensive and impractical. However when in course of the 1990s retro sixties-style celebrated a revival, Verner Panton also reappeared on the scene, for all as an exhibition and interior designer. Verner Panton's last exhibition, "Light and Colour" opened two weeks after his death in September 1998. The furniture manufacturer Vitra is internationally famous for its co-operations with many well-known designers of different styles; and indeed the company's first big success was achieved with the furniture designs of Charles and Ray Eames, and to this day the Eames' chairs, armchairs and tables count amongst the most popular products in the Vitra portfolio, while a large proportion of the pair's non-written estate is also in Vitra's possession. Other notable designers with whom Vitra have successfully co-operated include, for example, Antonio Citterio, Jasper Morrison and for all Verner Panton. Vitra was the only furniture manufacturer who was willing in the 1960s to take a risk with his now legendary Panton Chair. 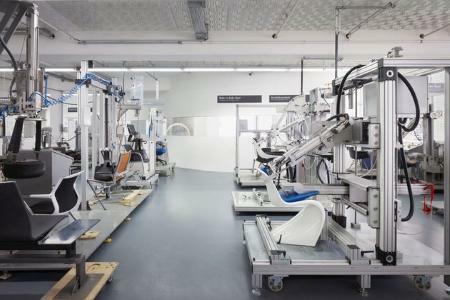 Based in Birsfelden near Basel Vitra is still family owned and works to and with the same high standards of quality and longevity of the products it always has. With Vitra furniture engineering knowledge and creativity fuse to create functional and inspiring interior design concepts. Many world-famous design classics are produced by Vitra, much more than just the ever popular Eames Plastic Chairs or the Panton Chair. 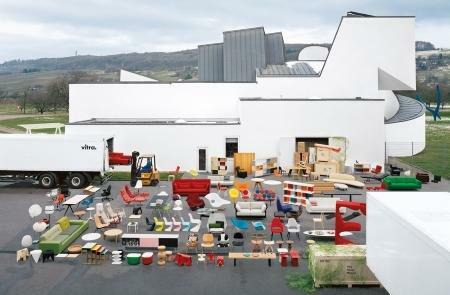 In addition, at their base in Weil am Rhein, Germany, Vitra can boast the Vitra Campus, an estate of buildings by international architects and which houses in addition to logistics and production buildings the Vitra Design Museum and a visitor centre. After studying architecture at the Royal Art Academy in Copenhagen Verner Panton began to work in Arne Jacobsen's office, including contributing to several furniture design projects. Both Jacobsen and Panton shared a preference for new materials, and for all materials which differentiated from the traditional Scandinavian woods. 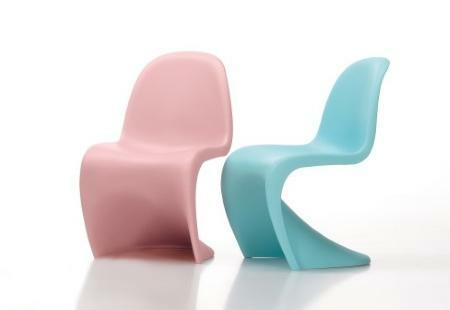 During his studies, Verner Panton had dealt with the idea of manufacturing a legless chair and a first S-shaped prototype originated from moulded plywood; however the new plastic materials appearing in the late 1950s promised a lot more possibilities, as it was not bound to material-specific forms and could be coloured as required. The first cantilever chair made of plastic was developed by the designer in cooperation with the company Dansk Acrylic Teknik and presented in the Mobilia-Club, with the aim of attracting a larger producer. That however remained wishful thinking and Panton went back to the plywood technology. Only in 1962 did the Swiss manufacturer Vitra take a liking to the unconventional chair and wanted to produce it in series: a wish which took a few years later and numerous failed attempts to realise. 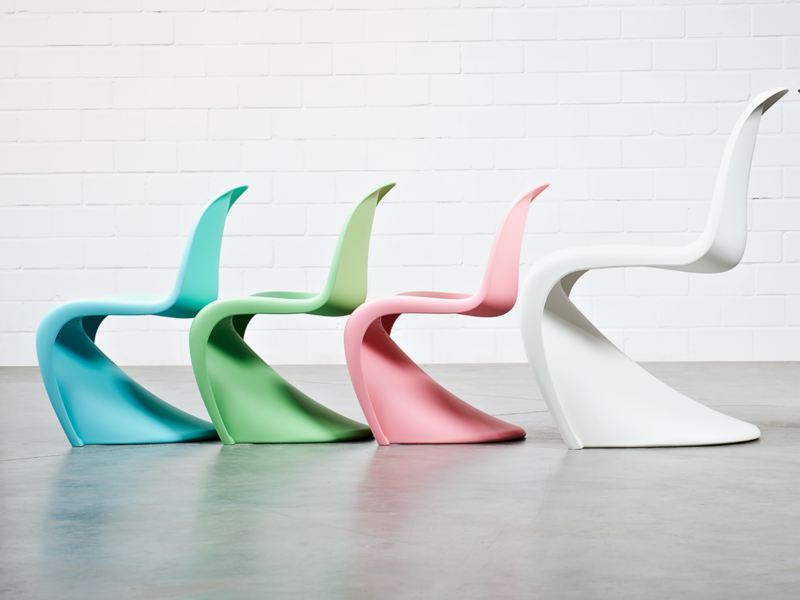 The then Panton chair, today the Panton Chair Classic, is composed of rigid polyurethane foam and has a gloss finish. Later sophisticated injection moulding technology meant this method could be replaced by a somewhat simpler process meaning the chair could be made of reinforced and coloured polypropylene. 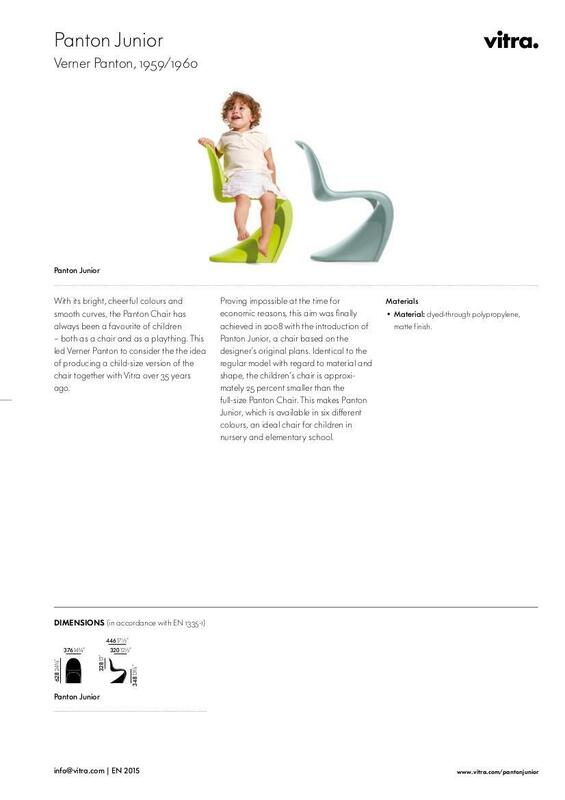 This is the material used in the Panton Junior, which makes it such a robust and workable high chair and which allows its matt surface and bright colours. The mid-20th century was the most creative and successful period in Verner Panton's professional life: a period during which the population sought new colours and new shapes to replace not only the damage and loss of war but the memories of what had just happened. The emerging plastic materials enjoyed great popularity as they not only fulfilled the public's wishes but were cheap and flexible. The new found freedom afforded by synthetic materials was keenly explored by Verner Panton for the design of his furniture, and this experimentation allowed him to break simultaneously with both traditional production methods and traditional furniture materials. For all the wood that until then had dominated Scandinavian furniture production. Verner Panton was thus one of the founders of pop design, a movement which originated in the 1960s in conjunction with the Pop Art movement and was characterized by psychedelic patterns and especially flashy colours: characteristics which are reflected not only in Panton's plastic cantilever chairs but also his upholstered furniture, including, for example, the Amoebe. 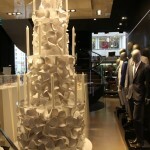 As one of the major protagonists of the era Verner Panton received numerous recognitions and awards for his work. (smow) blog Design Calendar: February 13th 1926 - Happy Birthday Verner Panton! 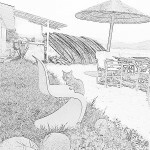 The travels of Verner, Panton Chair junior.